According to the Federal Highway Administration (FHWA), in 2012 there were 1,357,430 miles of unpaved road in the United States, accounting for almost 35 percent of the more than 4 million miles of roadway in the Nation.1 However, nationally unpaved roads only account for approximately 2 percent of fatalities. Although nationally the percentage of fatalities and serious injuries are low, in some states these roadways account for up to 20 percent of the fatalities. Local and rural road owners are responsible for a large proportion of these unpaved roads and need information on strategies to enhance the safe operations on these roadways. 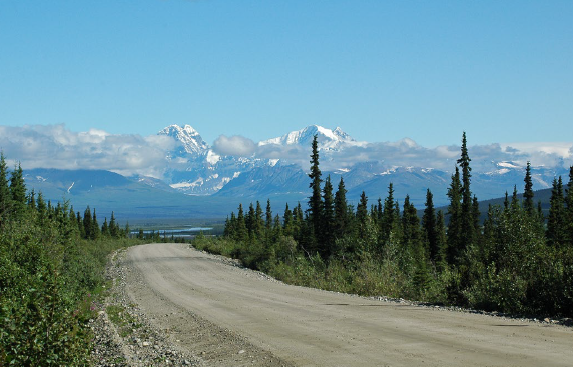 There are safety strategies that can be employed to improve safety on unpaved roads, and this document describes safety needs and treatments of unpaved roads. An abrupt change from a paved to an unpaved surface creates a risk of skidding and losing control of the vehicle. Advance warning about upcoming unpaved conditions for unfamiliar drivers is critical. As long as the roadway is consistent, drivers soon adjust their behavior to match the limitations of the road; however, because of low traffic volumes and minimal law enforcement presence on many unpaved roads, drivers may travel at unsafe speeds. When inconsistencies are present, the driver may be taken by surprise, which can result in an increase in crash risk. Minimal or non-compliant signing and delineation. Similar to paved roads, a wide, flat, and less obstructed clear zone is desirable for an unpaved road to reduce the severity of a roadway departure. Consider relocating fixed objects such as utility poles in the right of way and adding delineation to utility poles that cannot be moved. Consider adding delineation or shielding obstacles. Clear vegetation from the right of way in locations where animal crossing are likely and at horizontal and vertical curves, intersections, and driveway locations. Mow along the edge of the roadway to improve the visibility of signage. Install advance warning signs and highly visible chevrons at curves. Install delineators to provide a visual "edge" to the roadway. Use highly retroreflective sheeting for signage to increase visibility. Assess the need for warning signs near locations such as narrow bridges and on the approaches to curves. Review speed limits and consider increased enforcement as required. Too much surface water can weaken a roadbed resulting in rutting, potholes, shoulder erosion, ditch washouts, and clogged culverts. Provide well-graded, crushed surfacing aggregate with adequate binder to reduce raveling, dust, loose aggregate, and washboards. Ensure adequate drainage with timely ditch and culvert maintenance to prevent saturated surface or sub-base conditions or frequent overtopping of the roadway. 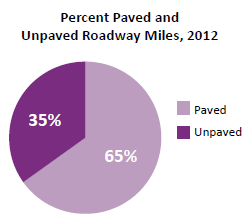 Unpaved local and rural roads represent a significant share of the public roadway system in some states. Road owners should understand the types of safety challenges presented by these facilities as well as the types of safety treatments available to address these challenges. Bustad, Jacob, Good Gravel Roads, Kansas LTAP Fact Sheet. 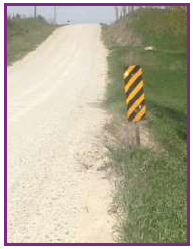 Field Guide for Unpaved Rural Roads developed by Wyoming Technology Transfer Center, March 1997 and updated by Kansas Local Technical Assistance Program, July 2004. Huntington, G. "Road Geometry, Surface Materials Are Key to Safety on Gravel Roads," Safety Compass Newsletter, 6:2 (6) Fall 2012. Huntington, G. and Ksaibati, K., Gravel Roads Management: Implementation Guide, Volume 2 (University of Wyoming: October 2010). Huntington, G. and Ksaibati, K. Gravel Roads Management, Volume 1 (University of Wyoming: October 2010). 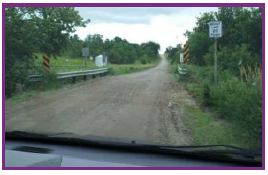 MacDonald, T. and Sperry, R., Evaluation of Mitigation for Safety Concerns on Low-Volume, Unpaved Rural Roads (Iowa State University Institute for Transportation: May 2013). South Dakota Local Transportation Assistance Program (SD LTAP), Gravel Roads Maintenance and Design Manual (Washington, DC: November 2000). 1 Federal Highway Administration, "Highway Statistics 2012," (Washington, DC: 2012). 2 Huntington, G. "Road Geometry, Surface Materials Are Key to Safety on Gravel Roads," Safety Compass Newsletter, 6:2 (6) Fall 2012. 4 MacDonald, T. and Sperry, R. Evaluation of Mitigation for Safety Concerns on Low-Volume, Unpaved Rural Roads. Iowa State University Institute for Transportation: Ames, IA. May 2013. 5 Huntington, George. Safety Compass Newsletter. Federal Highway Administration, 6:2 (6) Fall 2012.